Rapid development and diffusion of computer technology in daily life has created a wealth of problems and possibilities for researchers. E–mail and the Internet enjoy everyday use by many people, and this fact is altering how evaluations are conducted. Evaluators in a variety of academic and applied settings are using online surveys for evaluation or are contemplating using Web–based data collection strategies in the near future. Public health professionals use surveys to evaluate services and courses, businesses and marketing teams use them to evaluate quality of service and the effectiveness of advertisements, educators assess program outcomes, and those who oversee clinical trials in biotechnology and pharmacology use them to test the outcomes of intervention. These are just a few of the many ways in which online surveys are used in evaluation. Although some fundamental survey research principles can be applied to online surveys, the unique features of the method require special consideration. 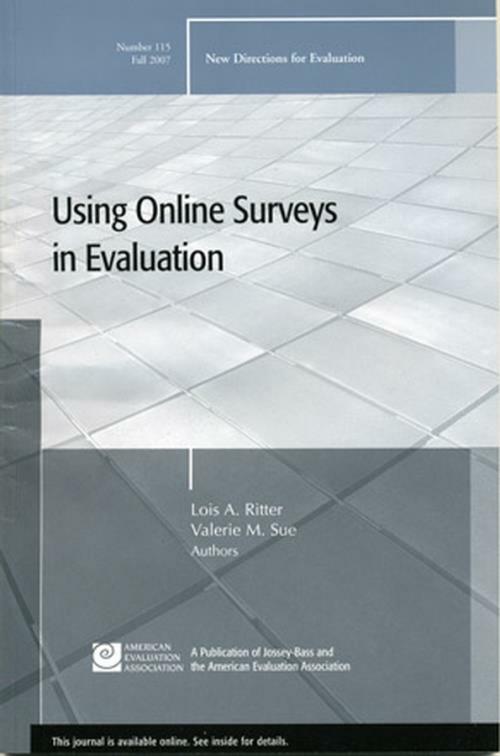 This volume is a useful guide for anyone wishing to use online surveys for evaluation. The chapters address how online surveys can be integrated into the planning, data collection, and data management phases of an evaluation and how they can be incorporated into numerous typs of evaluation projects, such as needs assessment and impact evaluation. This is the 115th volume of the quarterly report series New Directions for Evaluation, a publication of Jossey–Bass and the American Evaluation Association.